Our Bungee trampolines are the latest craze. 4-in-1 Bungee Trampoline. A unique and exciting leisure activity derived from the world of extreme sports. 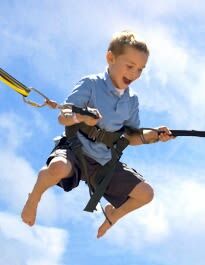 Bungee Trampoline offers a gravity defying thrill for participants of all ages. Unlike a normal trampoline, the 4-in-1 allows participants to jump over 2 stories (8 meters) high. Safe and secure in adjustable purpose-built harnesses, jumpers are free to experiment with acrobatic movements. The result is a thrill with all the adrenalin of bungee jumping but with none of the risks. The 4-in-1 Bungee Trampoline trains and tunes bodily co-ordination. Bungee Trampolines can provid a guaranteed unforgettable experience. There will always be at least 1 fully trained staff watching over the Bungee Trampoline participants at all times to ensure they have a very safe and incredibly fun experience. Don't hesitate to book today as this service is very popular and you definitely don't want to miss out on this incredible attraction. The price you see includes delivery, set up and collection and one attendant.